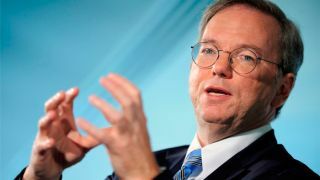 Google's executive chairman Eric Schmidt kindly gave up his weekend to write a lengthy step-by-step guide for iPhone users who are thinking of switching to Android. In the post on his personal Google+ page, Schmidt said that an Android phone would be "a great Christmas present to an iPhone user!" He said: "Like the people who moved from PCs to Macs and never switched back, you will switch from iPhone to Android and never switch back as everything will be in the cloud, backed up, and there are so many choices for you. 80% of the world, in the latest surveys, agrees on Android." The series of 'Schmidt tips' advises new Android phone owners on how they can make use of iCloud and Gmail to get iPhone contacts onto the new phone. It also explains how users can get iTunes music onto the Android phone, by using Google Music Manager and syncing to the company's cloud locker. Are you an iPhone user? Would you welcome an Android phone in your stocking this Christmas? Or would be aghast that a loved would even consider it? Let us know your thoughts in the comments section. Find out why everyone on the internet is turning into Eric Schmidt?